Hitler's lightning invasion of Poland in 1939 marked the beginning of World War II in Europe. This was the period when armoured warfare inscribed itself into global consciousness as the Poles desperately sought to stave off the Blitzkrieg. At the heart of the fighting on the ground, large numbers of Nazi Germany's PzKpfw II battled against Poland's better-armed but much less numerous 7TP tank. The two types both possessed unique strengths and weaknesses - unlike the 7TP the PzKpfw II was always equipped with radio, which proved critical for command and control purposes in the heat of combat. But the German tank was blighted by thin armour, which could not withstand Polish gunfire at combat ranges. 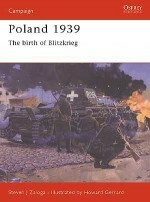 This fully illustrated, detailed work evaluates the qualities and idiosyncrasies of each tank, giving a stark and arresting crewman's-eye-view of the brutal armoured combat at the height of the invasion of Poland. David R. Higgins is the author of several military history books, including The Roer River Battles, King Tiger vs IS-2: Operation Solstice 1945 and Mark IV vs A7V: Villers-Bretonneux 1918. He has also written nearly 50 articles for magazines such as Strategy & Tactics, Armchair General, World at War and Modern War, and has appeared on television's ‘Greatest Tank Battles'. Richard Chasemore finished a four-year course in technical illustration in 1992. Since then he has worked on a huge variety of projects in publishing and advertising, using both traditional and digital media. He has run an airbrush course in St Louis, Missouri, and also written six educational books on digital art. He has spent 10 years working on the best-selling Star Wars Incredible Cross Sections series, which has taken him to Skywalker Ranch in California to work with the Lucasfilm concept artists. He also enjoys music and is a co-founder of Superglider Records.